Individually adjustable brush roller contact pressure through variable adjustment of the brush roller by means of handwheel / crank. Drive: Gerotor Motor – compact motor provides high torque at low rotational speed delivery. Wheels: heavy duty Ø 200 x 80 mm / 7.87 x 3.15 in. 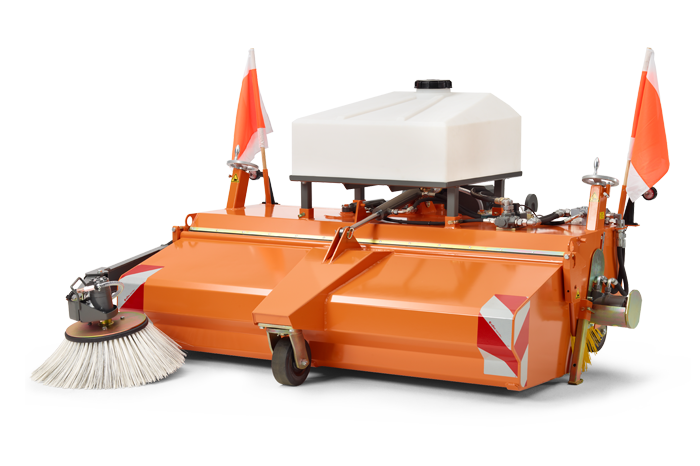 sweeping roller made of PPN Ø 600 mm / 23.62 in. side sweeper, weight ca. 33 kg. water spray system, weight ca. 28 kg (without water). All options are available for all variants of the equipment from 1850 to 2600 mm working width.